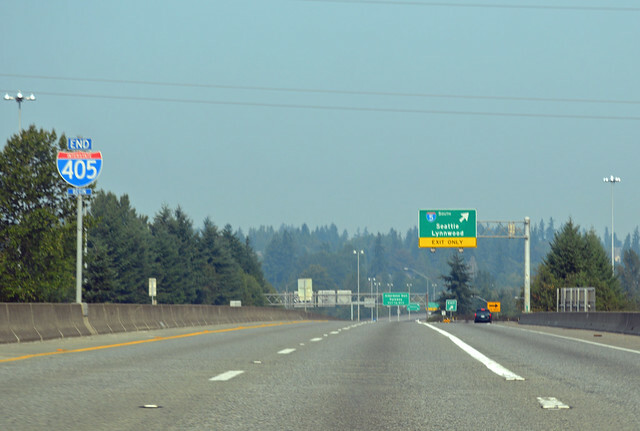 On Sunday, August 23, 2015, we zipped around Lake Washington on I-405. 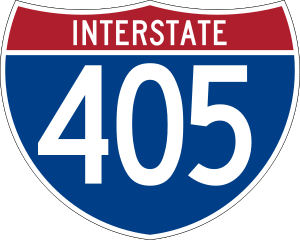 I usually call it just "405", but for the sake of uniformity with the other interstate highways on this blog, I'll append the "I-". It most definitely is not called "the 405". That's in California. 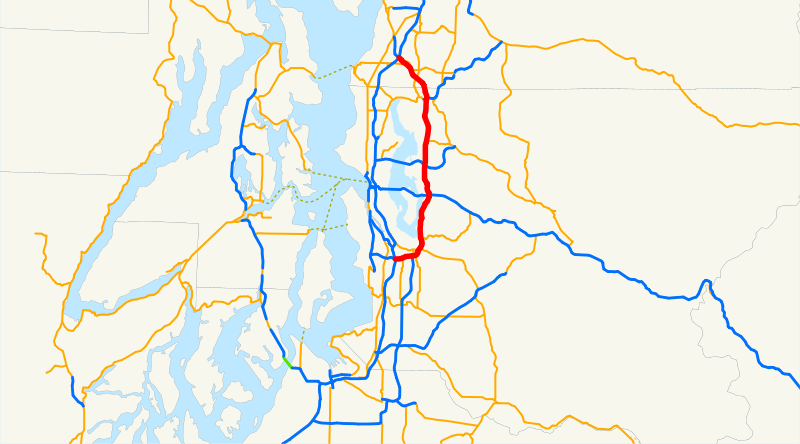 Beginning at a junction with state route number 5 in the vicinity south of Seattle, thence northeasterly to Renton, thence northerly east of Lake Washington to a junction with state route number 5 north of Seattle. 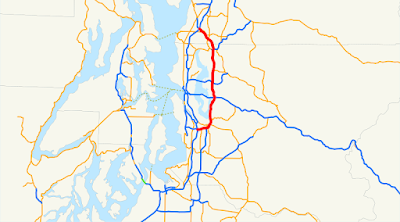 In Tukwila (City slogan: "You know... Southcenter. "), I-405 begins underneath I-5 where SR 518 comes to an end. 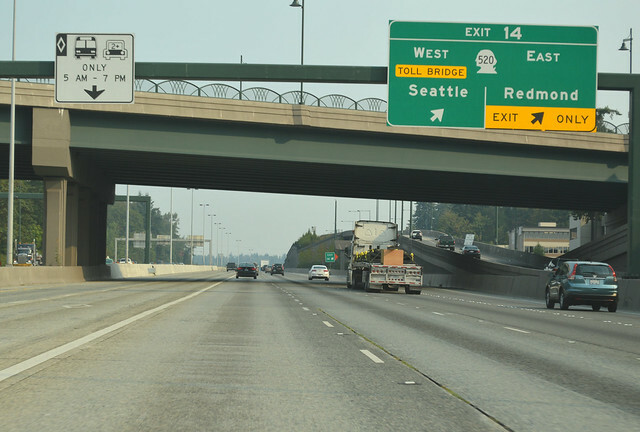 In the photo above, we're still on SR 518 and I-405 begins halfway under that first I-5 overpass. Technicalities. A mile later, at the other side of skinny Tukwila ("You know... Southcenter. "), we arrive at the interchange for SR 181, the West Valley Highway. We're about to cross the Green River, between the overpass and the offramp, but not that you'd notice. After another mile or so, we arrive in Renton ("Ahead of the curve. "), heading much more east than north, even though 405 is signed north for its entirety this direction. 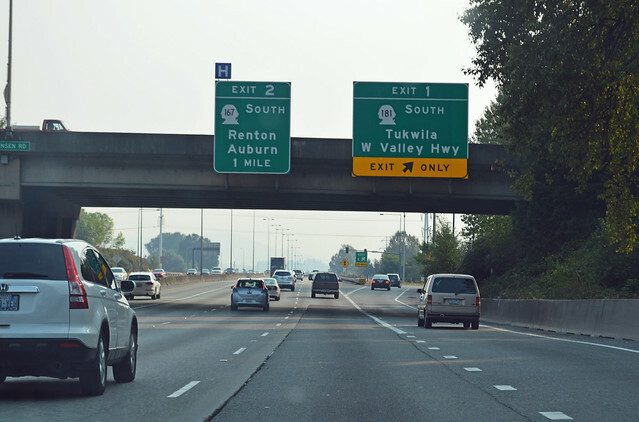 Here we reach the interchange for SR 167, the Valley Freeway. Still in Renton ("In the curve. 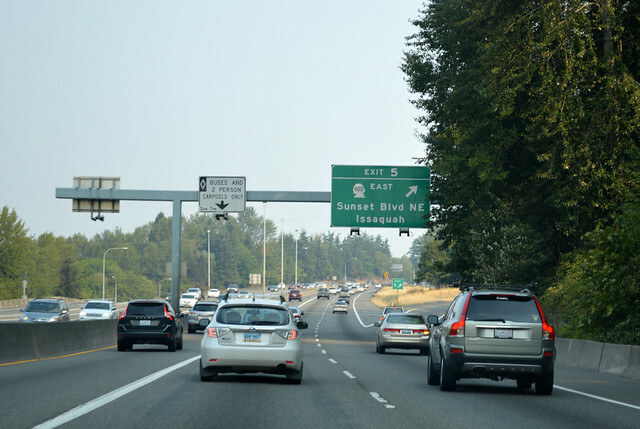 "), we quickly find this unmarked junction with SR 515, which was added only in 2010. It's a half-diamond, so we only see the onramp as we turn northward. 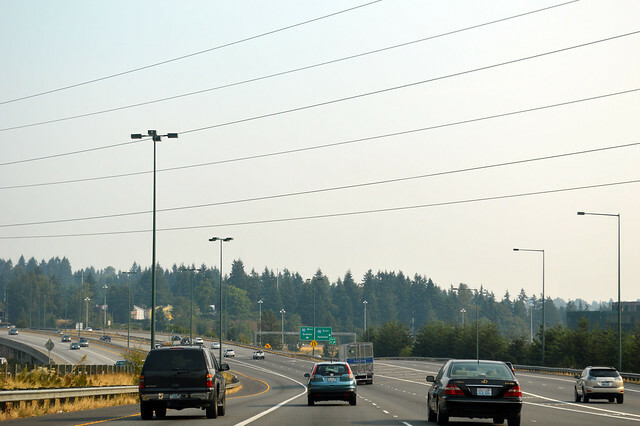 We pass the heart of Renton and enter the Cedar River drainage, crossing that river itself as we arrive at this interchange with SR 169, the Maple Valley Highway. 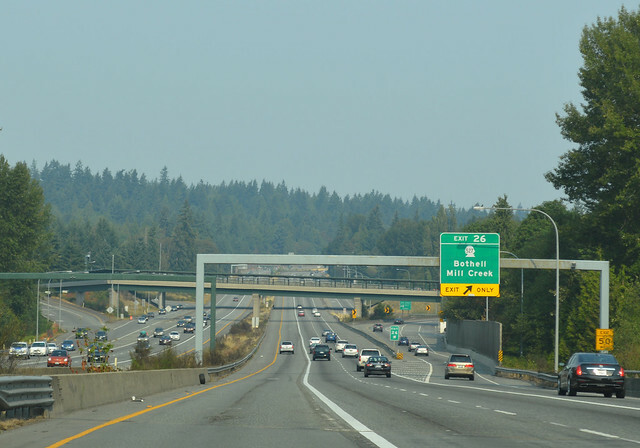 Note that, although the sign mentions SR 900, I-405 and SR 900 don't actually touch here, but are connected by a short stretch of SR 169. 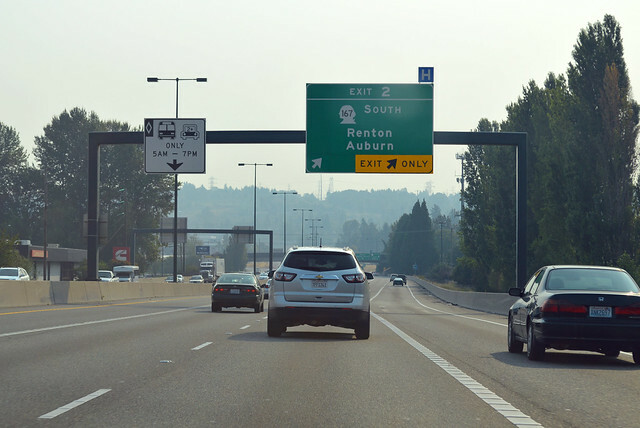 Renton sure does have a lot of highway junctions! And we're still in Renton ("Behind the curve"). Less than a mile after Highway 169, SR 900 finally shows up as an onramp. We then head for the hills, past Kennydale and Newport for the glorious land of Factoria. Welcome to Bellevue. Here be I-90. 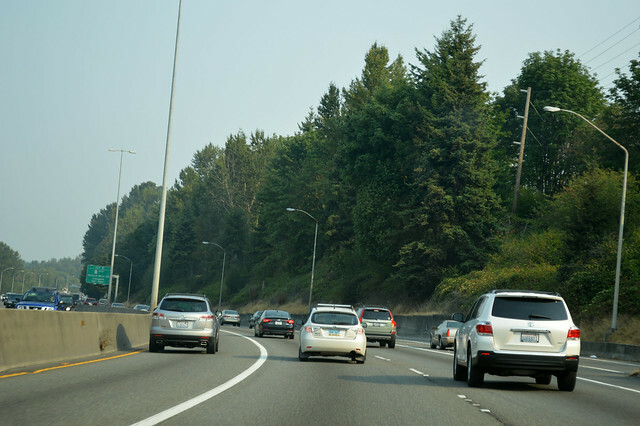 We head north along the Mercer Slough and through downtown Bellevue before arriving at the interchange with SR 520. Bellevue has fancy overpasses. 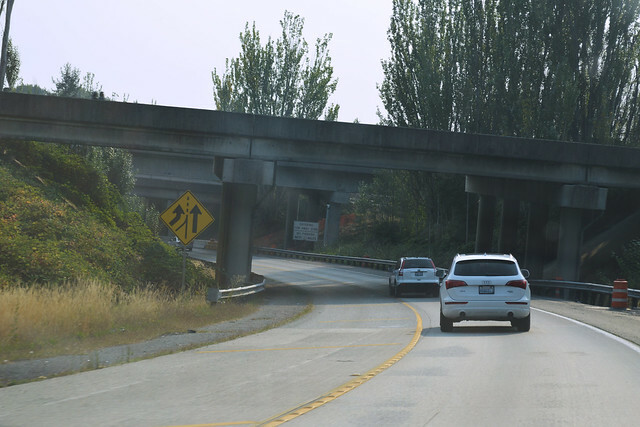 In case you didn't know, all of I-405 (except maybe in Tukwila) has a different color scheme than the rest of the Washington highway structures, more tan than the typical gray paint WSDOT uses elsewhere. We continue northward through the wilderness of Kirkland... or so it seems, for all the trees. Cresting the summit between Norway Hill and West Ridge, we descend to the Sammamish River, Bothell, and a junction with SR 522. Shortcut to Wenatchee! 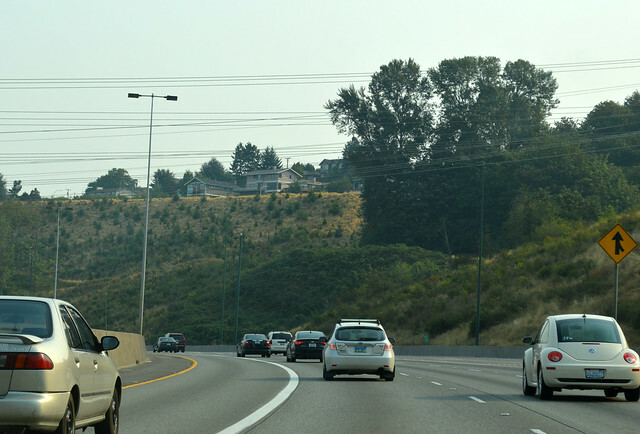 I-405 bends northwestward as we cross Bothell. After a few miles, we find an interchange with SR 527. 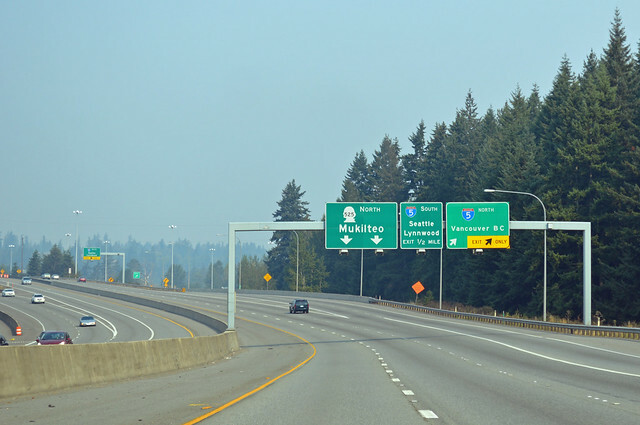 A few miles after that, through the forests of Snohomish County, we find ourselves at the Swamp Creek Interchange. We have returned to I-5! 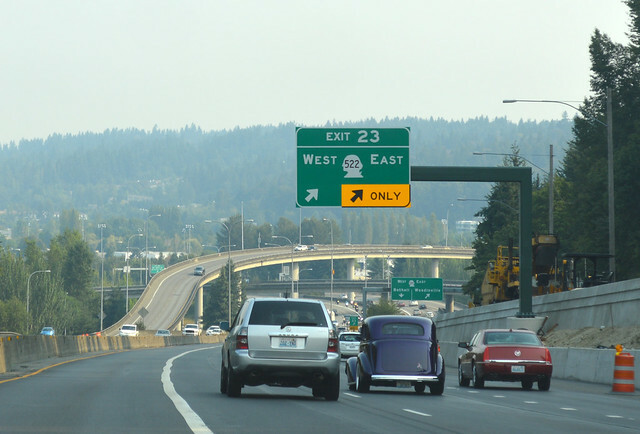 In the middle of the interchange, I-405 ends. From here on out, this road is SR 525. Have fun in Mukilteo. Crowded in most places on a Sunday morning, I-405 sure must be fun on weekdays. And by "fun", I mean the opposite. Yeah, 405 was so much fun for the six months I commuted from Federal Way to Bellevue. Ugh. 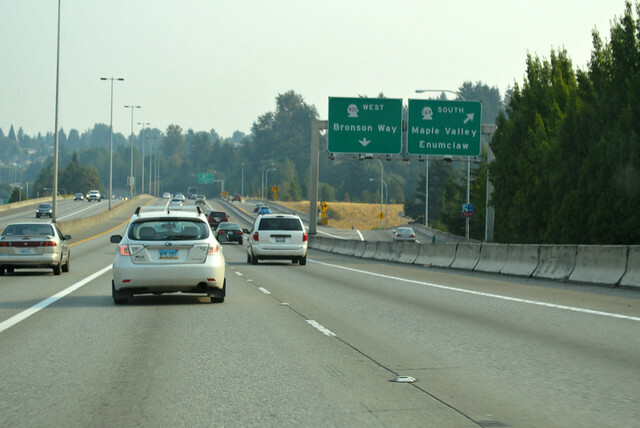 I love this blog, thanks for this look at our freeways. Cheers. Also people dont know how to drive in america, some stupid bullshits slowing people on the left lanes when the slow drivers need to drive on the right lanes.